Over the years I have discovered some amazing products to solve life’s peskiest problems. They may not be glamorous, but believe me – once you discover them you won’t want to live without them. Anyone who gets regular headaches will know they’re not fun. 4head is seriously the best thing I’ve discovered for headaches. You just swipe it on your forehead and it has an amazing cooling effect. This doesn’t replace painkillers for me, but it’s another weapon in my war on headaches. When the tablets aren’t quite doing the trick I reach for this and it really helps. This stuff is BRILLIANT. Just rub it on before you put your shoes on and it creates a barrier which magically stops your shoes rubbing. I won’t be without this in the summer as it’s perfect when you’re wearing sandals – I pop it in my bag and make sure I reapply. Blisters, be gone. People laugh at me when I tell them about my bag organiser – until they see it in action. It’s basically an insert which you put inside your handbag, which has loads of compartments and pockets. There’s a place for all your little bits and pieces, so you’ll never be rooting around in there again. Plus, if you have bags of similar sizes you can lift it out of one and into another, so you can swap bags in a cinch. Genius, right? Are there any practical products which you can’t live without? 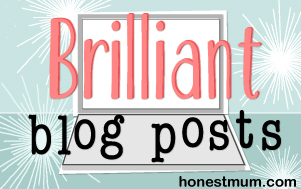 This post is part of the ‘brilliant blog posts’ link up. Love this! I don’t go anywhere without my compeed blister patches – but they’re expensive and messy to remove. I should give the rub a go instead. You won’t regret it. My friends say my bag contents resemble that of a very well-prepared mum! I’ve often wondered does 4Head work. As someone who gets headaches most days I might have to give it a try. Also love the bag organiser. It’s one of those things I love the idea of but I probably wouldn’t get the use out of since I don’t carry a handbag often. Still, good to know for the future. Looks handy! I don’t think it’s an exaggeration to say it will change your life. Oh, I know the feeling. 150 receipts, 79 bus tickets and 12 packets of paracetamol didn’t make the list! I can’t believe I forgot about it haha! !